The staff at Christopher Heights, an assisted living facility in Marlborough, is always looking for meaningful ways to help their residents serve the community. Last week, their efforts caught the attention of local police. On Thursday, February 5th, Marlborough Police Chief Mark Leonard was called to the Pleasant Street facility and arrived with back-up in the form of Lieutenant Thomas Bryant and Patrol Officer Cathy Digou. The extra hands were needed to carry out a full lunch for the entire department courtesy of Christopher Heights' Executive Chef Luke Savageau. Accompanying the supply of sandwiches, chips and home baked dessert goods was a huge card that read, "Big thanks to you," and was signed by the residents of Christopher Heights. "We feel like the police are under appreciated," commented Christopher Heights Executive Director Denise Jones, who said that her staff and residents were in agreement that a formal thank you was in order. Aiding Jones in setting up the event was Activities Director Keri Tetreault. "We love to stay involved in the community," said Jones, "and it is important to our seniors to stay connected." As it turns out, several residents had a personal tie to law enforcement, having grown up in a family with a parent who served on a police force. On the flip side, one resident, Lucile Digou, raised a police officer, and she was proud to have her daughter, Cathy, on hand with Chief Leonard to receive the tribute from Christopher Heights. Jones said there was a common thread among stories told by residents who had a parent in law enforcement. There is the ongoing worry of the loved one's well being while on duty, and the loss of time with a parent who was less available because of the demands of the job. "They sacrifice all the time," said Jones, "The thanks was overdue. We should have done it a long time ago." Chief Leonard expressed gratitude for Jones' kind words and for the prepared lunch. Then he spent some time advising residents on general security. He was also appreciative that the staff and residents of Christopher Heights took time to think about the positive contributions of the police force. "It's a tough job and it's getting harder," commented the chief. "You tend to hear about the negative so it is nice to hear the positive." Among the roughly fifty staff and residents in attendance was Helen Jarzobski who will be celebrating her milestone, one-hundredth birthday in March. She told Chief Leonard there would be a place for him at Christopher Heights when the time was right. "When you're old, you can come and live here," she said. 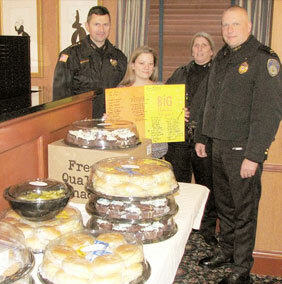 Shown in picture with the various luncheon items prepared by Executive Chef Luke Savageau, are (l-r) Police Chief Mark Leonard, Activities Director Keri Tetreault, Officer Cathy Digou and Lieutenant Thomas Bryant.